Between 1575 and 1577 Venice was suffering from a dreadful outbreak of the plague. More than a third of the population died. In September 1576 the Senate voted to erect a church dedicated to Christ the Redeemer as an offering and a plea for divine help. The following year, in July, the city was finally declared free of disease, and it was decided to celebrate Venice's deliverance every year with a festival and a church service. Each year a temporary bridge, floating on pontoons, is erected over the Giudecca Canal between the Zattere and the Church of the Redentore. The religious celebrations are held on the third Sunday of July. The night before (Saturday) is a great party with feasting followed by night-time fireworks and the weekend finishes with a gondola regatta. While the famous February Carnival is an event largely re-created for tourists, the Redentore is still an authentically local event, and is very important to the people of Venice. The times we give relate to the most recent celebrations; the schedule may vary slightly. On Saturday evening at 7pm the 333m-long bridge, called the Ponte Votivo ('votive bridge') is opened and there is a special religious ceremony at the Redentore Church. Around this time you'll see boats and barges laden with festival-goers making their way along the canals to take their places on the water. Families sit around tables in specially-decorated boats. All kinds of vessel are hired out for the occasion, including transport barges. Some of these, packed with young revellers, moor cheek-by-jowl to create a kind of multi-boat disco. Those unfortunate enough to be without boats throng the waterside. Local people, some of whom have previously chalked 'reservations' on the waterfront, bring out tables and chairs and enjoy convivial meals. In the late evening, around 11:30pm, the lagoon shore and all Venice's roof terraces are packed for the big event, the firework display. This is a massive show, and sternly judged by local people, who'll be praising or criticising the music and fireworks for days. The firework display takes place over the water between St. Mark's and the Giudecca, and lasts around half an hour. Afterwards there's applause (or booing) from the massed boats and crowds. Then everyone packs up and heads home, creating once-yearly queues in the alleys and lanes of the city. The best places to watch the fireworks from are the Giudecca - which gets very crowded - and Riva degli Schiavoni, although here you may find moored boats obstructing the view. Since public transport is very limited during the evening, we recommend you find a viewpoint from which you have an easy walk back to your accommodation. 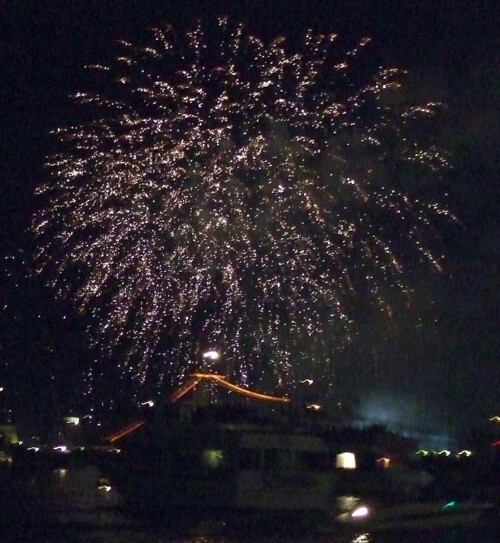 For a more distant view of the fireworks exploding over Venice, try heading along the Riva to Sant'Elena, or even taking one of the boats that still runs towards the Lido, which has its own special night-time events and entertainments. 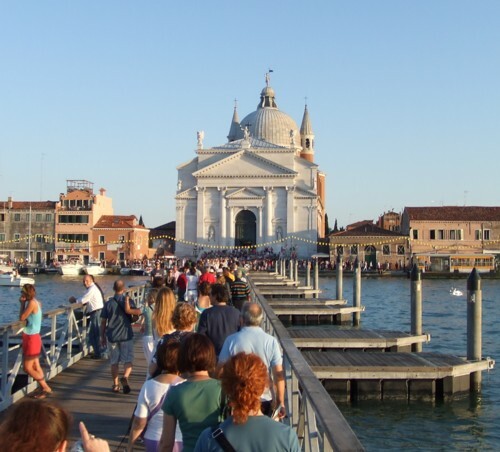 The floating bridge remains in place on Sunday, when you can walk across it to church, or to the traditional Giudecca regatta, the Regata del Redentore. In the late afternoon local people gather to watch races of gondolas. These brightly-painted vessels are rowed in Venetian style, with two standing oarsmen. The main race is a big event, with spectators collecting outside waterfront bars, viewing through binoculars, and having earnest rowing discussions with their comrades. A fleet of boats - families, friends, spectators - follows along the far shore as the gondolas head up the Giudecca Canal past the Molino Stucky. The finishing line is back outside the Redentore church. As so much of the event takes place on the water, Venice's water-bus routes are nearly all blocked. Public transport is drastically limited from around 8pm onwards on the Saturday - check at ferry stops for a poster with details of services. Lanes will be very crowded after the firework display and you'll find it a slow walk home. If you are unfortunate enough to be based on the mainland, expect huge demand for buses and trains.